There is absolutely no one who knows Indian food better than Madhur Jaffrey. I have three of her cookbooks that I've made splendid Indian meals from. I don't know why I waited so long to make this particular recipe from her cookbook "An Invitation to Indian Cooking". It includes my favorite vegetable, and better yet it doesn't require any exotic or hard to find spices. 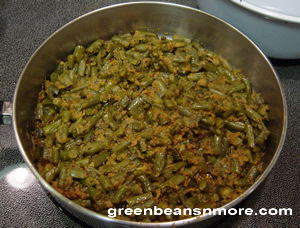 Whether you enjoy it as a vegetable side dish or as a main vegetarian dish I guarantee you'll find yourself making this delicious and easy to make Indian green bean recipe again and again. As Madhur Jaffrey notes in her cookbook, these green beans "will be a brownish dark green, smothered in spices and utterly delicious." Please read my "Cooks Tips" following the recipe. Wash the beans. Trim the ends. Slice the beans into rounds about 1/8" - 1/4" thick. Put the onion, garlic, ginger, tomato and turmeric in a blender and blend into a smooth paste. Put 6 tablespoons of the vegetable oil in an 8-inch skillet or heavy-bottomed pan, and heat it on medium. Pour in mixture from blender and fry for about 5 minutes, stirring all the time, adding a teaspoon of warm water if and when it starts to stick to the bottom. Now put in the coriander and cumin and continue frying another 5 minutes, again adding a teaspoon of warm water if necessary to prevent sticking. In a 10-inch skillet, heat the remaining tablespoons of oil over a medium flame. When very hot, put in the whole cumin and mustard seeds. After 10 seconds, add the whole red peppers if you are using them. Stir once, and as the peppers darken and the mustard seeds begin to pop, put in the sliced green beans and the sliced green chili if you are using it. Now scrape up all the mixture from the first skillet and add it to the beans. Fry the beans on medium flame for 5 minutes, stirring all the time. Turn heat to low, add the salt and lemon juice, and let the beans cook covered, stirring now and then, until they are tender (about 35 minutes). If you are using cayenne pepper, stir in 5 minutes before the end of cooking time. If the beans stick to the skillet, add 1 tablespoon of water, stir and keep cooking. These beans can be cooked in advance and reheated over a low flame. Serve them in a warm dish, and if you like sprinkle finely chopped Chinese parsley over them. Cook's Tips: Fry the mixture from the blender in a deep heavy pot to keep splatter down. Make sure you fry the mixture well, it's essential to the overall flavor of the dish. I think it needed a bit more lemon. I also used a lot more cilantro than called for. It's a fabulous blast of flavor in the dish. I think the dish needed to cook longer than 35 minutes, I'd suggest you allow 45 minutes.